How do I accept Online Payments with Stripe? Accepting online payments with credit cards is fast, safe and easy. You can connect your FreshBooks account to either one of our payment gateway options, Stripe (US, Canada & International) or FreshBooks Payments powered by WePay (US & Canada click here). Note: Are you based outside of US and Canada? 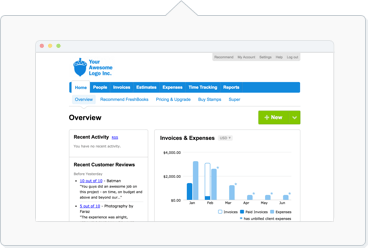 You'll see FreshBooks Payments Powered by Stripe instead. Click here for more info. Looking for Authorize.Net, Braintree or PayPal? These gateways are currently not supported in FreshBooks. With Stripe, your Clients will have the ability to pay their Invoices with a credit card, and you can sit back and watch the money get added to your bank account automatically. Connecting Stripe to FreshBooks takes less than 10 minutes and will require you to create a free Stripe account (or log into an existing Stripe account). You'll also want to follow the steps in the From An Invoice section below to enable it on an Invoice as well. Stripe should now appear. Click on Connect Stripe to finish the credit card payment set up. Your invoice is now ready to be paid with a credit card! All your client has to do is click the Pay Now button when they receive your invoice. To see what your client will experience, click here. How do I turn Accept Online Payments on or off on an Invoice? Accept Online Payments will now be set to YES or NO (Invoice will or will not accept online payments by credit card). What does it mean if an Invoice is "Processing"? This means that your Client submitted a payment through Stripe and Stripe's team is reviewing the transaction to ensure it's safely processed. This can take up to several business days depending on the transaction. Once it's reviewed and is successful, the Invoice will be updated to Paid status and the funds will be on its way to your Stripe dashboard.